West Windsor, NJ – Like most rowers, Carter Levine of the Princeton National Rowing Club / Mercer (PNRA/Mercer) spends a lot of time training on the ergometer, an indoor rowing machine. Workouts on the ”erg” develop the specific muscles needed for rowing and give rowers the opportunity for supplemental training when they cannot get on the water in shells. Levine stands out among rowers when it comes to erging though. He recently set two world records and one American record for indoor rowing. The Princeton High School junior rowed 500 meters in 1 minute, 19.4 seconds, which was a world record for 15-16 year olds. Two weeks later, he rowed 1000 meters in 2 minutes, 55.3 seconds, which also was a world record for 15-16 year olds. In addition, he set an American record for most meters rowed in 30 minutes by a 15-16 year old male by rowing 8325 meters, narrowly missing the world record by less than 100 meters. Levine also holds the Caspersen Rowing Center record for fastest 2000-meters on an erg by a high school-aged rower, which he captured by breaking his older brother Alex’s record. Alex is now a freshman, rowing for Princeton University. 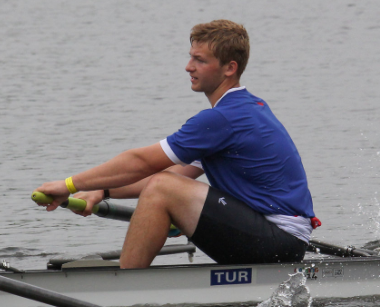 Levine began rowing in the spring of his freshman year of high school, choosing rowing over playing lacrosse. The move paid off for him. By spring of his sophomore year, he was part of PNRA/Mercer’s varsity eight boat which competed at the 2015 USRowing Youth National Championships and finished eleventh in the nation. At least one rower was inspired by Levine’s accomplishments on the erg and made his own attempt at breaking an indoor rowing record. Freshman Jack Gallagher (Council Rock North High School, Newtown, PA) was successful in setting the world record for most meters rowed in 30 minutes by a 13-14 year old male by rowing 8115 meters. All indoor rowing records are recorded on the website www.concept2.com/indoor-rowers/racing/records.